Recycle and reuse all your worn out clothes and bedding. Even when you have upcycled your old clothes and bedding into new fab things, you will still be left with bits and pieces. A great way to reuse any strips that are left over is to make binding with them. This can them be used to embellish or finish off any future recycling projects. I love to have lots of different binding ready, so all I have to do is choose what looks best!! You can buy little devices that will curl material into perfect binding strips, but..... wheres the fun in that :) This is a method you can try using just an iron, a ruler and a thin piece of cardboard. 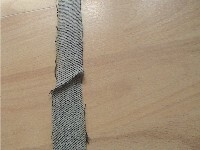 In this example the material is cut on the grain. 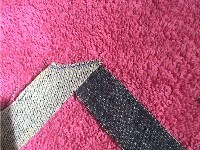 Bias binding is usually cut diagonally across the grain, this can't always be achieved with scraps of material and straight binding is perfectly acceptable for most projects. 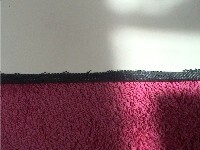 To Make binding that is 12mm wide, first measure strips that are 25mm wide. 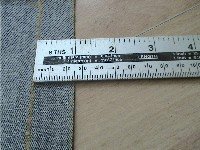 The photo shows the leg of denim trousers which I used to make the straps for a bag. 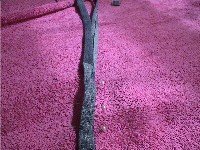 Cut out your strip of binding. Then mark 5mm in from each edge and mark a line or dashes. Take a thin piece of card with a straight edge and line it up with one of the lines. Turn the edge over the card and iron flat. Continue this along the length of the line. Do the same with the other line on the opposite side. 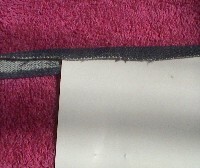 To join two pieces of binding together put the two ends at 90degrees to each other, right sides together and mark a line from corner to corner as shown. You can do this before you iron the folds over, or you can iron the end bits of the binding flat again to join them then iron them back into binding again. 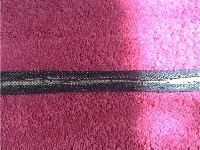 Sew along this line either by hand or on a sewing machine. 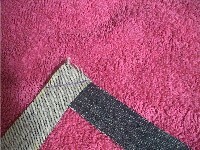 Trim the corner off quite close to the stitching and iron flat. 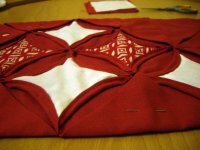 Either start to mark the binding from the beginning or re fold the binding into shape. 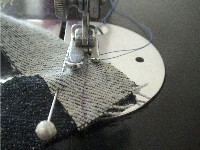 The binding should look as shown if you are starting from the beginning. 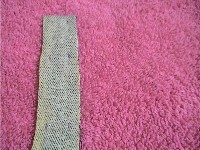 When complete the binding should look as shown and measure 12mm wide. This can be used as and when needed or made to match something specific. 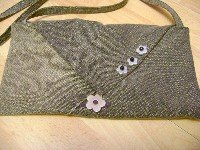 To make simple but effective bag straps pin two pieces of binding together, wrong sides touching. Sew along the edges staying as close as possible to the sides. If you enjoyed to recycle and reuse clothes, sign up for our newsletter and keep up to date with all the new pages and projects.